Findings from this study indicate that the Webex and non-Webex students were very similar in terms of demographic characteristics (Table 1). 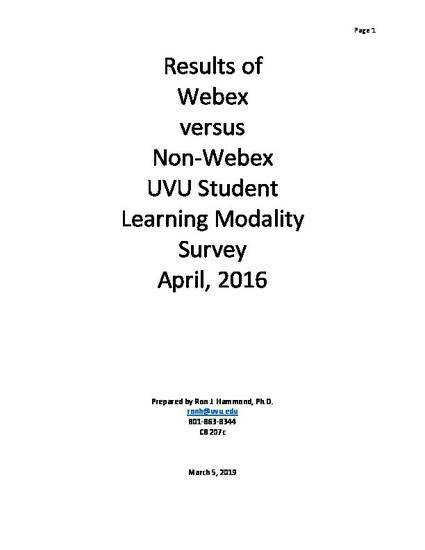 When asked about the variety of teaching modalities they used Spring Semester 2016, it becomes apparent that many of these UVU students were using modalities other than regular in-class courses. For example, 41% took an online; 12% took a live-interactive; 34% took hybrid; 5% took independent studies; and 8% took a Webex course Spring Semester 2016. Only 32% reporting that they exclusively took regular in-person classes (Table 2).